Dubai- September 27, 2013 - The Emirates Group Security Centre of Aviation and Security Studies (CASS) and Edith Cowan University of Western Australia have conferred 117 diplomas at its 11th graduation ceremony. The event was attended by His Highness Sheikh Ahmed Bin Saeed Al Maktoum, Chairman and Chief Executive Emirates Airline and Group, and Tim Clark, President Emirates Airline along with senior management of the Emirates Group and Edith Cowan University, and representatives from the security and aviation industry in the UAE. Professor Kerry Cox, Vice-Chancellor of Edith Cowan University, handed the diplomas in Aviation Security Management and Ground Handling to a diverse class of graduates, including a significant number of Emirates Group employees. His Highness Sheikh Ahmed bin Saeed Al-Maktoum and Dr Abdullah Al Hashimi Divisional Senior Vice President Group Security with the 17 Emirati graduates. Working closely with the Emirates Group’s National Recruitment & Development, Group Security has been actively cultivating the development of young Emiratis in aviation security, supporting Tawteen, the nation’s Emiratisation initiative. The new batch of UAE Nationals have successfully completed the mandatory Basic AVSEC (Aviation Security) programme outlined in the National Aviation Security Training Program (NCASTP). In addition to offering a university Diploma in Aviation Security Management, Emirates Group Security actively seeks industry professional certification for its UAE Nationals by providing advance structured aviation security courses such as Crisis Management, Train the Trainer, X-Ray Screening and Cargo Security. “Development of UAE Nationals is a key priority for the Emirates Group,” said Dr Al Hashimi. 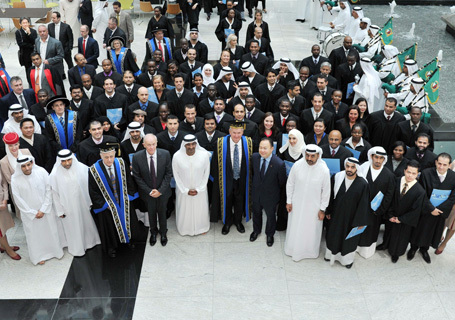 “The 17 UAE National graduates in this batch are a testament to that commitment,” he added. Established to address the growing demand for highly-qualified security professionals, the diploma programmes are part of the Centre of Aviation and Security Studies (CASS), a joint partnership between Emirates Group Security and the Edith Cowan University (ECU) since 2002. Aviation Security and Ground Handling play an integral part in the aviation industry and students from CASS receive training and specialised education which prepares them for a lifelong career in their field.